BELLINGHAM, Wash. – The Evergreen Premier League is excited to announce that Oly Town Football Club of Olympia, Washington has been accepted as the 8th club into the statewide elite adult amateur soccer league. 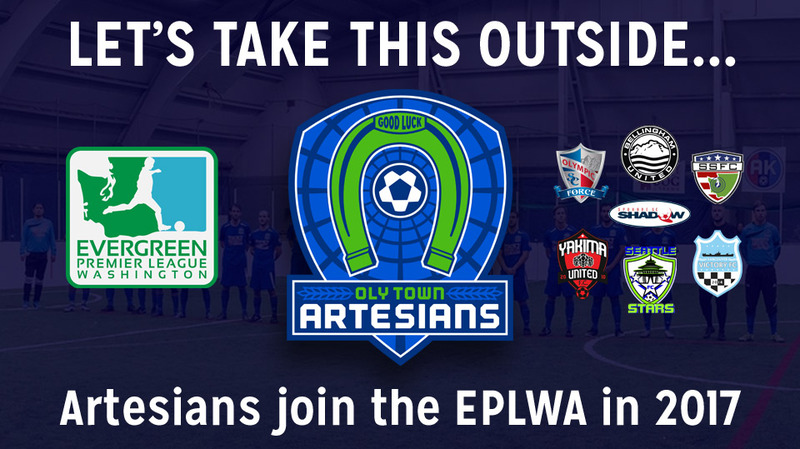 Oly Town FC, nicknamed the Artesians, will begin play in the EPLWA starting in the 2017 season which kicks off in early May. The Artesians will bring the highest level of non-collegiate outdoor soccer that Olympia has seen. The Evergreen Premier League is currently at the 4th Division level in all of US Soccer. Oly Town FC is already competing indoors in the Western Indoor Soccer League (WISL), a league they helped found back in 2014. The Artesians will continue to compete in the WISL, where they are currently in the early stages of an unbeaten campaign. The indoor season runs through the end of February with home matches played at the Evergreen Pavilion on the campus of The Evergreen State College. The club will at the same time begin making preparations for their outdoor debut. The Artesians have a strong online presence via their official club site at OlyTownFC.com, as well as social media pages Twitter.com/OlyTownFC and Facebook.com/OlyTownFC. The Evergreen Premier League of Washington (EPLWA) is an elite adult men’s amateur soccer league for college and post-college age players to feature their skills on hometown clubs throughout the state of Washington. The league’s mission is to cultivate “football club” culture while providing opportunities for coaches, owners, supporters, players and towns to enjoy the sport and all of the community-building it can bring. The EPLWA is a USASA Premier League awarded 4th Division USA status. The EPLWA is affiliated with the Washington State Adult Soccer Association, US Adult Soccer, US Soccer, the Washington State Referee Committee and FIFA. The EPLWA enters its 4th season in 2017 with 8 clubs from around the state of Washington: Bellingham United, Oly Town Artesians, Olympic Force (Bremerton), Seattle Stars, South Sound Shock (Tacoma), Spokane Shadow, Vancouver Victory (Vancouver, WA) and Yakima United.